Explanation: It can be the driest place on planet Earth, but water still flows in Chile's Atacama desert, high in the mountains. After discovering this small creek with running water, the photographer returned to the site to watch the Milky Way rise in the dark southern skies, calculating the moment when Milky Way and precious flowing water would meet. 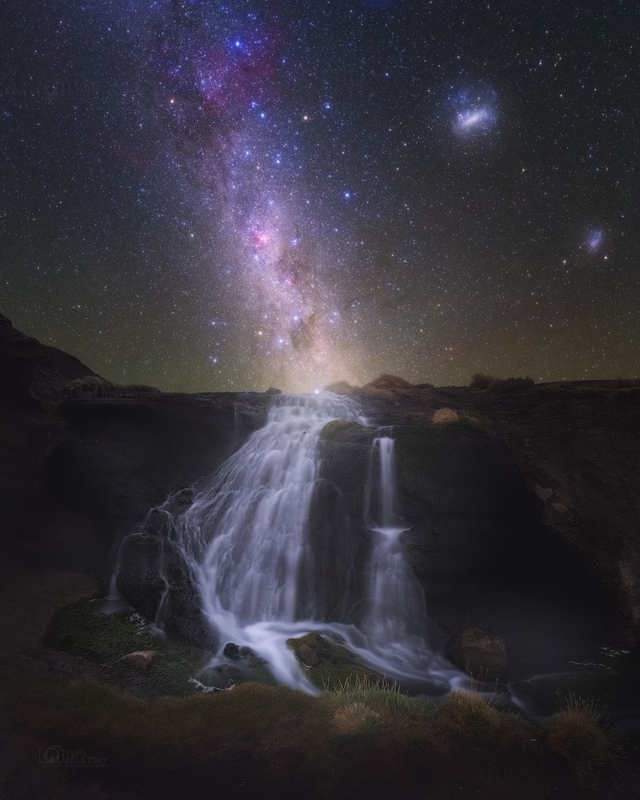 In the panoramic night skyscape, stars and nebulae immersed in the glow along the Milky Way itself also shared that moment with the Milky Way's satellite galaxies the Large and Small Magellanic clouds above the horizon at the right. Bright star Beta Centauri is poised at the very top of the waterfall. Above it lies the dark expanse of the Coalsack nebula and the stars of the Southern Cross.